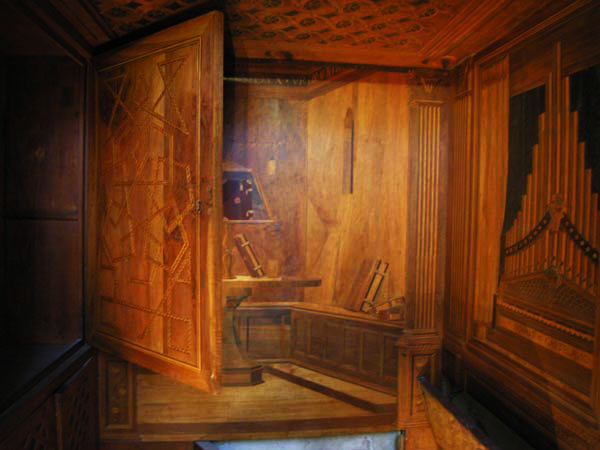 There was likely some debate over a seven- or eight-sided figure for the cabinet door. In the mid 1470's, Urbino court member Bartolomeo di Giovanni Corradini, otherwise known as Fra Carnivale, painted an octagonal figure in sepia tones, evoking intarsiated wood. Both figures are comprised of a single recursive line, suggesting that the selection of the heptagonal figure was deliberate.